Have you ever wondered why red and green are the dominant colors used to celebrate one of the most significant winter holidays? Why not purple and gold or orange and blue? Does the origin of these holiday colors evolve out of history, religion or Mother nature?Based on the research that I conducted recently, you can say “Yes,” to all three. As with any long standing tradition there are many stories/theories and I wanted to briefly share a few with you. Very few color combinations evoke such a strong association as red and green. A Historical Account: The Romans wove wreaths of holly to give as gifts to celebrate Saturnalia from December 17-25th, in honor of Saturn, the god of agriculture. They hung them on their walls and doors. Reportedly the 4th century Catholic Church leaders decided to celebrate Christmas (a mass for Christ) on Dec. 25th to counter these Saturnalia festivities. In their minds, the festivities of this pagan religion threatened the Christian religion and they decided to compete even though it was believed that Christ was born in the spring. While usurping this pagan festival, they took over some of the symbols and traditions and gave them deeper religious meanings. For a more in depth explanation on the origins of red and green representing Christmas, consider the symbols found in the story of Adam and Eve. It is interesting to learn how holly berries, red apples in pine trees and the red robes of church bishops, were the forerunners of Santa’s suit, Rudolph’s red nose and wrapping paper. Nature’s Contribution: On the other hand, you may think that the red/green tradition all began with the red berries and shiny green leaves of holly. Holly is one of the few plants that survives in the frigid temperatures of winter. 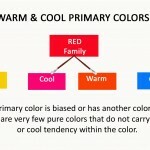 Interestingly, red and green are the only bright colors that thrive in nature during the winter. They give us hope that the cycle of life continues and spring (and warmth) is not far away. Long before Christ was born, the color green already held the powerful symbol of mystery and life. After most plants had died during the winter, fir trees and holly bushes remained ever green. People thought these plants were magical causing a sense of fear as well as reverence. Evolving over time, green came to symbolize life, fertility and hope. The poinsettia has also been given credit to contributing to the holiday colors of red and green. However, the plant was not introduced into America until 1828 by the first ambassador to Mexico, Joel Poinsett. I bet you didn’t know this little fact, eh? Notice that the plant was even named after him. The other reason poinsettia are popular is because the small yellow center is symbolic of the star of Bethlehem. As an artist, I find it an inspiring plant to paint as per my “Merry & Bright” painting above. Hence the traditional use of red and green has a long and rich history. I have one more theory about why red and green to throw into the mix — just for fun. 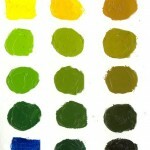 A Color Story: Could the father of the color wheel, Albert Munsell, have played a role? I know that I am going w-a-a-y out on a limb here but I couldn’t write about the glorious color complements of red and green without mentioning color theory principles. Right?!! We all learned at an early age that red and green are found opposite of each other on the color wheel. What does this mean or what might the ramifications be? When they are mixed together, they cancel one another out. In other words, you can dull a vibrant red by mixing some green with it and vice versa. Here you see an example of the impact red and green have on each other when mixed. Also, when these complementary colors are next to each other – as in our holiday decorations – they cause a visual vibration. Red and green sparkle and stand out when juxtaposed. 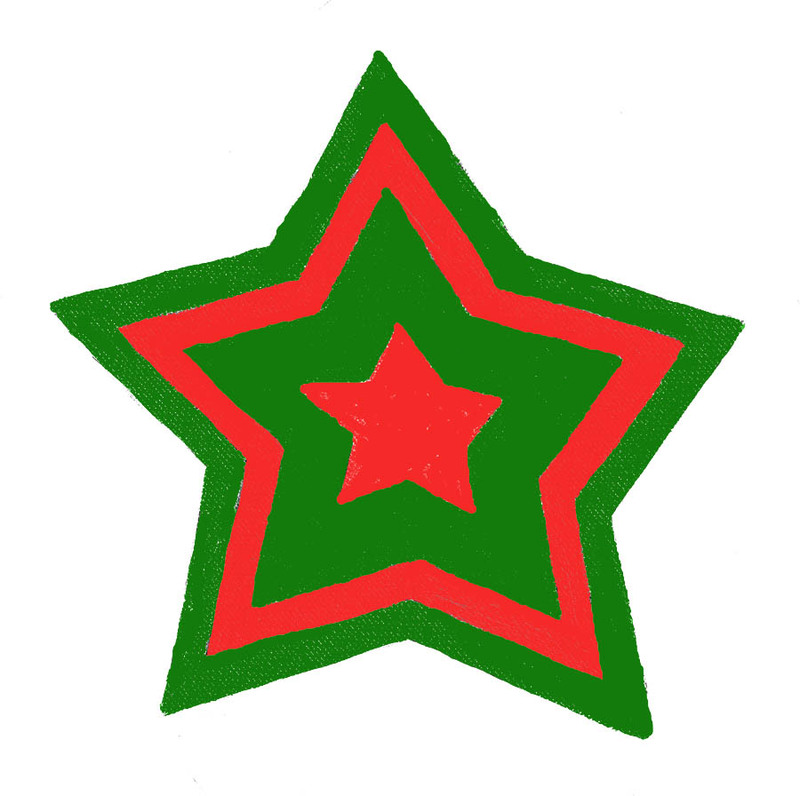 In this star I painted, notice how the reds vibrate because they are surrounded by green. Do your eyes start to do funny things if you stare at it for any length of time? Isn’t this another good reason why red and green help us to celebrate the holiday? Here is one more story that I will toss in to attempt to answer the ‘why red and green’ question: When I was much younger and driving through a Midwestern snow covered countryside, I asked myself, “Why are red and green the most popular holiday colors?” As I scanned the vista before me, I saw the red barns nestled in among the evergreen trees. Combine that with the sparkling twinkles of light bouncing off of the snow, I decided that I had found a reasonable answer. The isolated farmsteads were easily seen within the stark winter scene while conveying beauty and peace. What do you think? A few final thoughts: The combination of red and green is so ingrained into our Western society, that whenever most of us see the two of them together, we think of Christmas. Is this the reason why you do not see red and green as school or team colors? Many of us won’t wear red and green during any other season of the year because of its connotation. Kind of funny/interesting isn’t it? 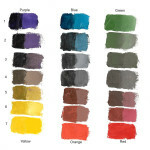 As I stated previously, few color combinations evoke such a strong association. 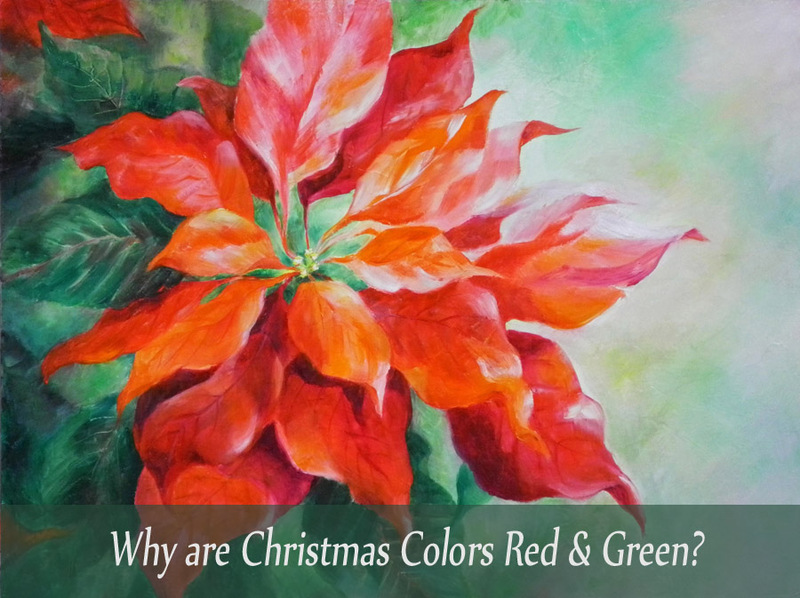 Hopefully you have found it interesting to learn why red and green are Christmas colors. What other color combinations come to mind that play a role in your life? Why? P.S. If you like this post and find it interesting, I’d love it if you’d share it via email or social media. You can use the buttons at the bottom of this post. I use Blue Host as my host provider and my site is a WordPress site. Thanks for letting me know that my site loads faster then most. I also make a point of making sure that my photos are not too big. This can, I believe, make a difference. Hope this helps. PS I think BlueHost is about $10-15/month, but I cannot remember.